Samford Psychology professor and department chair Stephen Chew recalls all three hours of teacher education he had has a graduate student, especially the percentages of As, Bs and Cs that purportedly defined a good teacher. He even kept those "magic percentages" on a piece of paper in his desk. "After a few years of teaching," he said, "I confronted the question that I think all faculty face at some point—a question that marks a critical juncture in their career—'I wonder what my students are learning?'”. Chew said many faculty members turn away from that fundamental question, possibly because they fear the answer. Those who embrace it, he said, uncover other questions and begin to devote themselves to finding answers that help their students learn. "And that is how, one day, I gave up on magic percentages and threw the paper away," he said. That not-at-all-magic moment has paid rich dividends for Chew's students and led him to the heights of both scholarship and teaching. He was named the 2011 Carnegie Foundation for the Advancement of Teaching Outstanding Master's and Colleges Professor of the Year at an awards luncheon in Washington, D.C., Nov. 17. "Dr. Chew's honor is well deserved," said Howard College of Arts and Science dean David Chapman. "Students love his classes for all the right reasons: he is knowledgeable in his discipline, innovative inhis approach to teaching, and committed to helping his students achieve theirfull potential". Chapman attended the Washington luncheon along with Samford board of trustees chair Clark Watson, president Westmoreland, provost and executive vice president Brad Creed and former arts and sciences dean Rod Davis, who hired Chew for Samford’s faculty in 1993. The CASE honor is the latest in an impressive list for Dallas, Texas, native Chew. He earned Samford’s John H.Buchanan Award for Excellence in Classroom Teaching award in 1999. In 2001, the Carnegie Foundation for the Advancement of Teaching named him Alabama Professor of the Year. 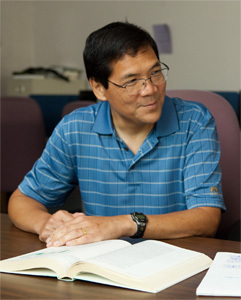 The American Psychological Association honored Chew with its 2005 Robert S. Daniel Teaching Excellence Award, recognizing him as the nation’s best psychology teacher at a four-year college. This summer Chew completed a practical and unique video series on the psychology of study(Seasons, Fall 2011). Since its launch this fall messages have poured in to let him know that it's being utilized throughout the nation, and has even been captioned for hearing-impaired students. Amy C. Fineburg, Assistant Principal at Oak Mountain High School and herself a multiple-award-winning teacher, had only one class with Chew as a student in the early 1990s but was so taken with his expertise and openness that she has counted him a mentor, friend and colleague in the two decades since then. Introducing Chew at the Professor of the Year Awards Program, Fineburg said "he opened doors for his students, helping them prepare forthe wide range of careers a psychology major can provide, and he did it with a smile, an easy-going way, and an extremely messy desk". "I audited his class in cognition and I was blown away," Fineburg continued. "Steve had a casual, but scholarly,approach to teaching that was unlike what I had before. I participated in more demonstrations and activities in his class than I had in any other class. He engaged us. He challenged us, and he entertained us". Chew continues that work with each new generation of students, challenging them in class, urging them to expand their understanding through undergraduate research, and helping them advance in their discipline. Psychology major Molly K. Cox is another of the many students who have benefitted from such mentoring. "I have had the privilege of collaborating with Dr. Chew to create an individual senior research project," Cox said. "This project willprove to be an invaluable asset on my résumé as I am applying to graduate programs this spring". Cox said Chew has even guided her through the admissions process for those programs. In his comments at the award ceremony, Chew thanked his own teaching mentors, including Gerry Dalby of Carter High School in Dallas, Bob Young and Janet Spence from the University of Texas, Jim Jenkins and Herb Pick from the University of Minnesota and his father, Ju-Nam Chew, who was present at the ceremony with Chew's spouse, Daisy, his son Michael, and his brother and sister-in-law, Lawrence Chew and Dannette Lowry. "Great teaching is a selfless act," Chew said. "Student learning comes before your own ego and convenience and you rely heavily on the support of family, colleagues and the school’s administration." Of course, one also has to be willing to throw out magic percentages and step onto what Chew described as the "the slippery slope to effective teaching". "Once you adopt the attitude that the measure of teaching effectiveness is student learning, a lot of teaching’s most difficult conundrums become solvable," Chew explained. "You learn the difference between teaching that makes it easy for students to learn and teaching that makes it easy for students to make a good grade; You give up moving from teaching fad to teaching fad and start to develop knowledge that will move the whole teaching enterprise forward; You give up the idea that good students make for good classes; and you realize that great teachers can create great students, and great students, like Amy Fineburg, can inspire and create great teachers".